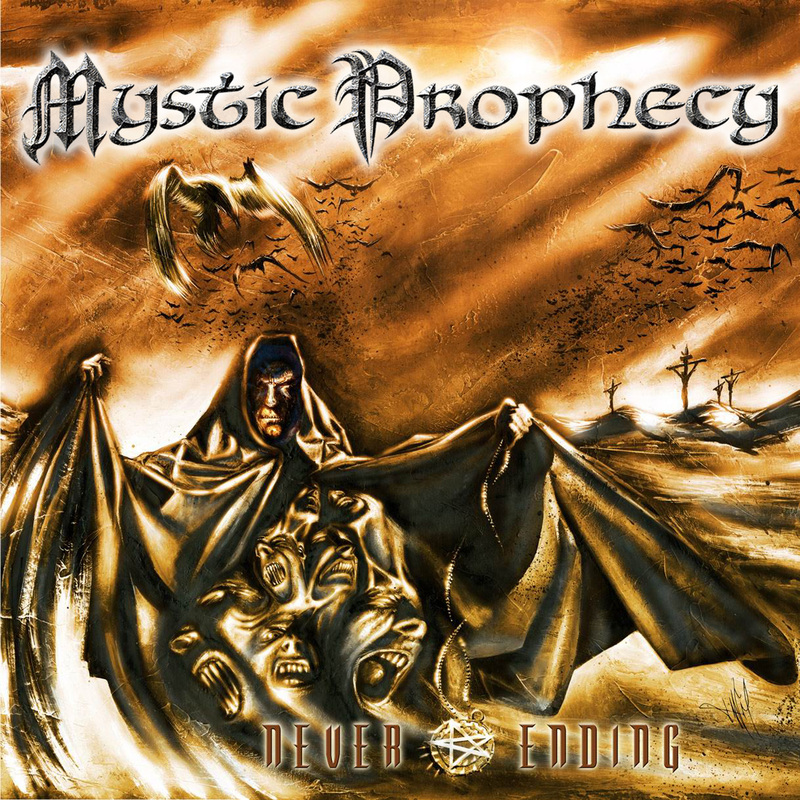 Finally available again: MYSTIC PROPHECY's third album "Never Ending"! MYSTIC PROPHECY - playing music in the vein of bands like Accept, Judas Priest, Exodus, Forbidden or Testament - has become one of the biggest surprises within the global metal scene in the last years, standing for powerful and dynamic metal at its best! With their debut album "Vengeance" (2002), MYSTIC PROPHECY filled a gap within the scene, and received great reviews all over the globe. The follow-up "Regressus" (2003) even topped the high quality of the debut! "Never-Ending" (2004) was followed by "Savage Souls" (2006), a traditional metal album, which was presented live during an extensive and successful headliner tour with Majesty. With "Satanic Curses" (2007), MYSTIC PROPHECY stepped out of their power metal comfort zone and delivered "the world's heaviest heavy metal album". MYSTIC PROPHECY confirmed with "Fireangel" (2009) that the band's still standing strong, which was verified live with an European tour with Statovarius as well as numerous festival appearances. Promoting "Ravenlord" (2011), the band topped all expectations as co-headliner of the so-called "WolfsnÃ¤chte" tour with Powerwolf and with gigs at festivals such as Metalfest, Summer Breeze, NOAF or Prog Power. 2013 saw the release of "KillHammer", which was accompanied by a tour with Masterplan in autumn as well as an European headliner tour a year later. In 2015, MYSTIC PROPHECY focused on writing new material for the upcoming album "War Brigade", which was released in mid-March 2016. Following the re-releases of the debut album "Vengeance" in January 2017 as well as the second album "Regressus" in April 2017, MYSTIC PROPHECY will now also re-release their third album "Never Ending" as a remastered limited edition digipak including two exclusive bonus tracks!